Naturalism in the Service of Extreme Melodrama. 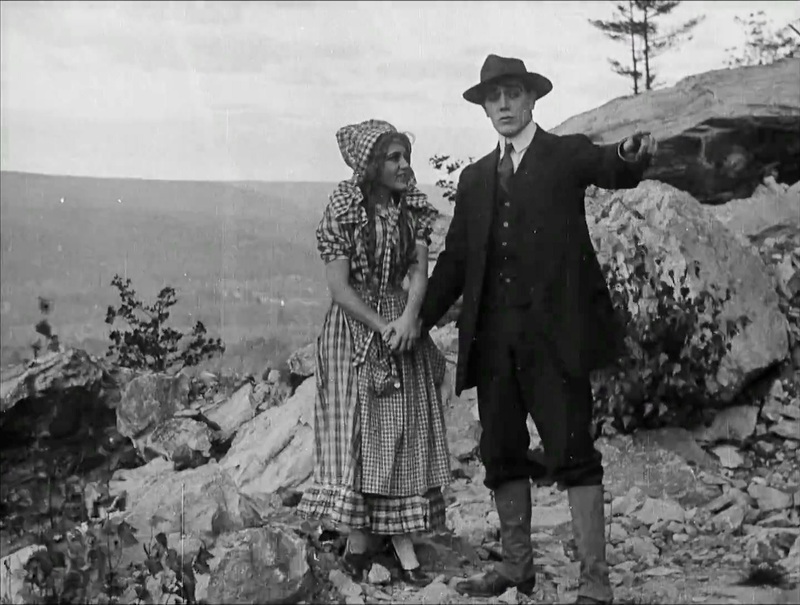 Not nearly as ridiculous as she might seem at first sight, Harum-Scarum (Mary Pickford), bounces into our lives and that of the young mountain poet (Owen Moore). Though he tries hard to appear cool, he is clearly smitten and pretends to be deep in thought with his book of poems and a fistful of tiny wildflowers. 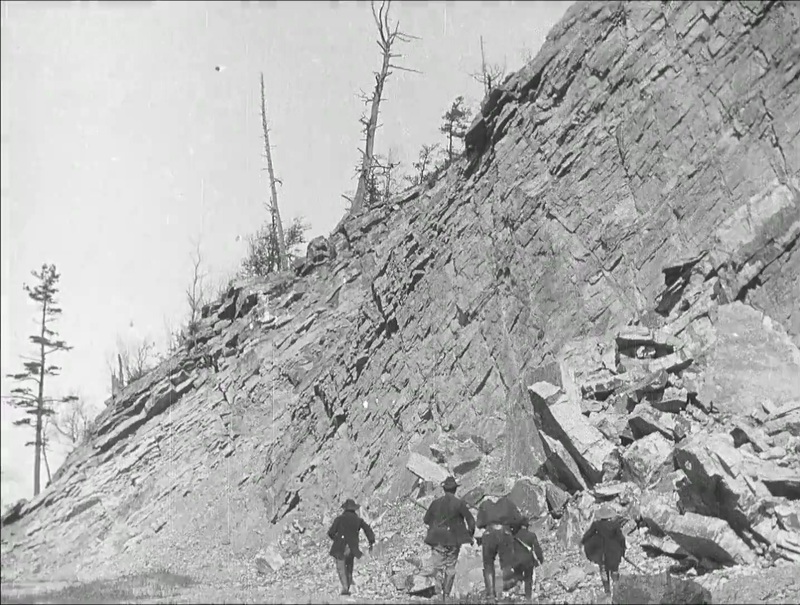 The Mountaineer’s Honor (Biograph, 1909, director D. W. Griffith). The most popular form of theater in the United States during much of the 19th century was the melodrama, featuring familiar character archetypes with equally familiar plot devices. 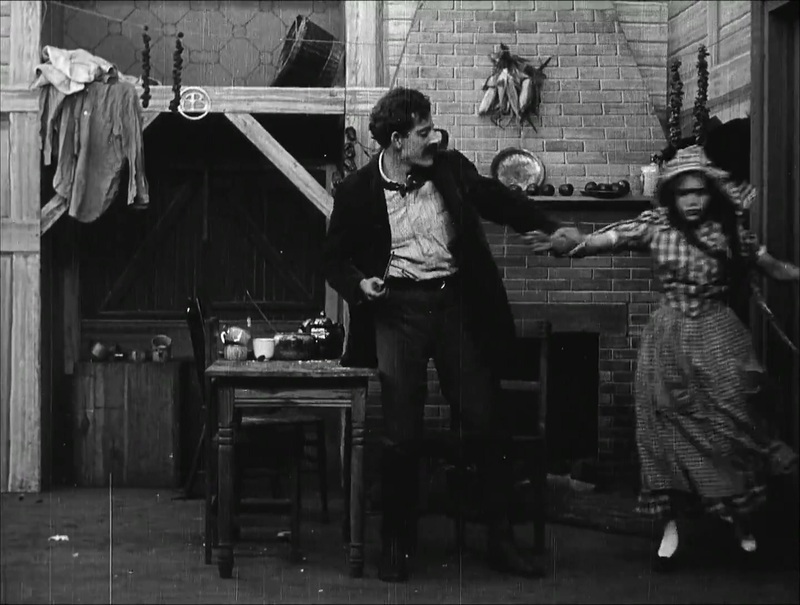 The prescribed acting techniques of melodrama — the use of specific gestures and poses to signify emotions — were illustrated in countless manuals for aspiring actors. By the end of first decade of the 20th century, however, the methods of melodrama had been supplanted by naturalism, in which the goal was a more realistic expression of emotion. 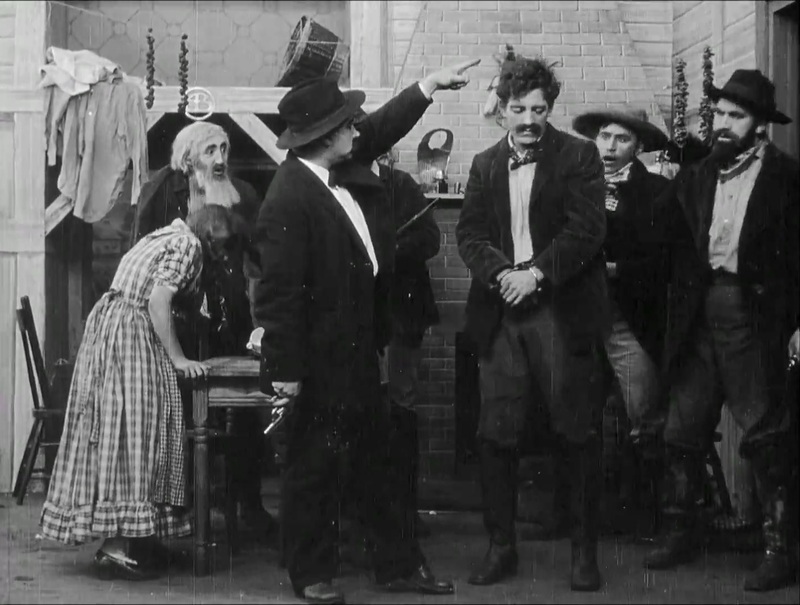 The trend to naturalism also began to appear in European films, most notably at Pathé Fréres. In the U. S., ultra-conservative American Biograph had been reluctant to change — naturalism meant slower acting and less action per foot of valuable film stock, quite the opposite of the accepted American film industry business model. This would change soon, in tandem with company fortunes. Biograph had barely escaped liquidation after the 1907-08 economic depression. 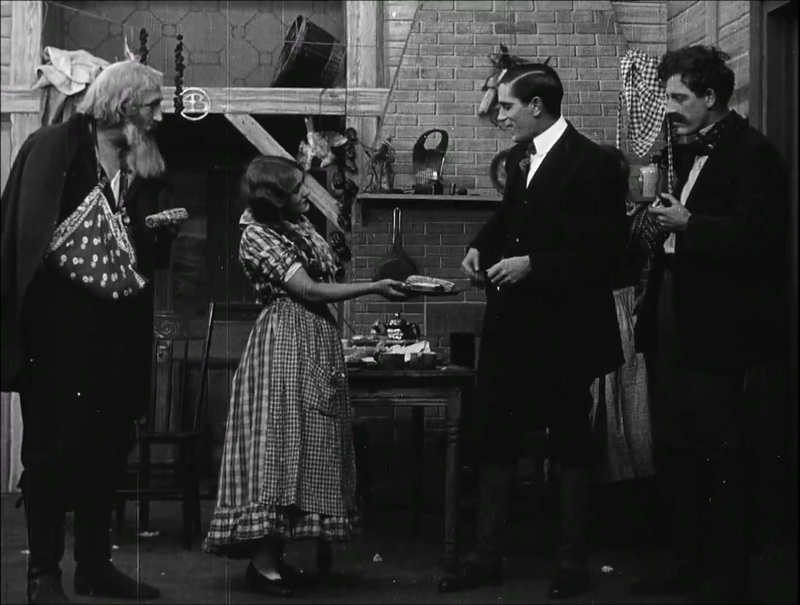 But by mid-1909, director D. W. Griffith — still using “Lawrence ‘Larry’ Griffith” as a nom de cinema to keep his film work secret from potential employers in the legitimate theater — had made dozens of successful films to help restore the firm’s flagging finances and artistic reputation. Griffith had more than a decade of experience in melodrama as an actor (a poor-to-mediocre one by contemporary accounts) and as a would-be dramatist. 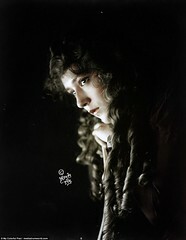 Griffith had no practical experience with naturalism, and had refused his actors’ previous requests to adopt the method. 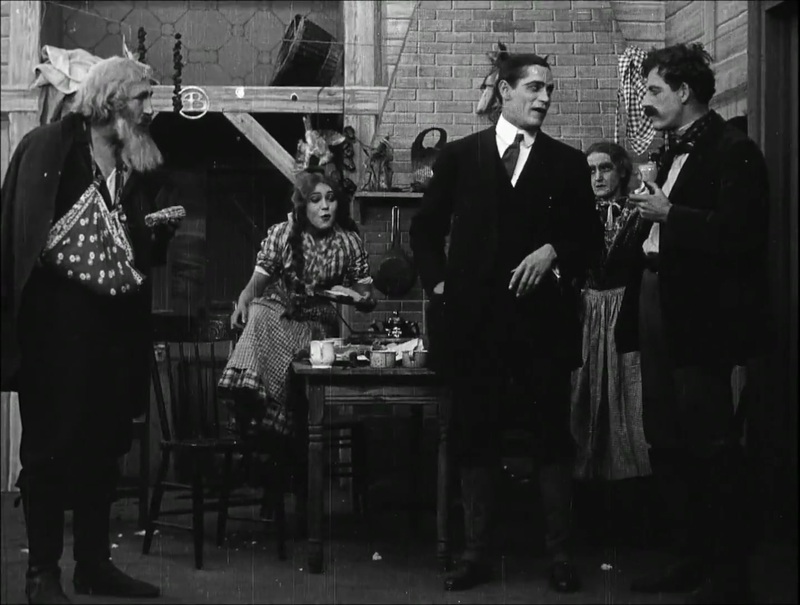 However, with a new contract in August, 1909, and a year’s worth of commercial and artistic success behind him, he may have felt more comfortable trusting his most talented actors. 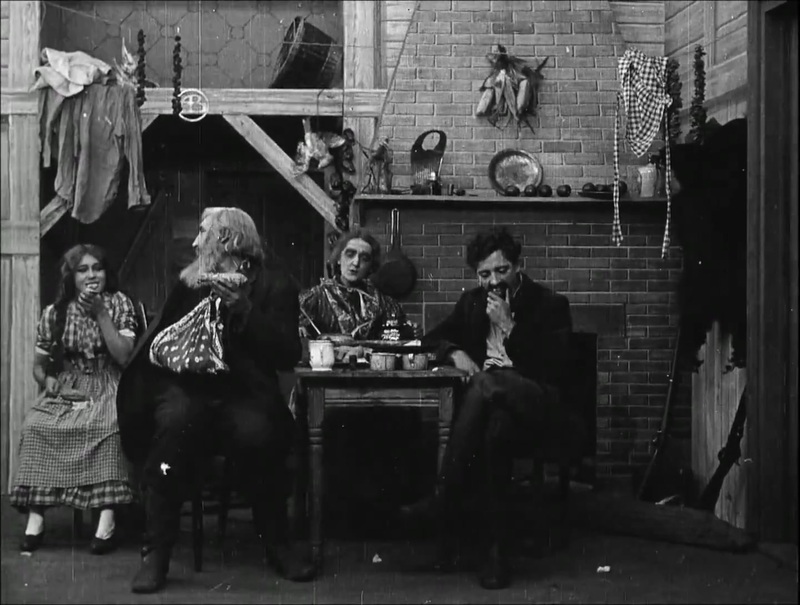 During the next four years, both the new naturalism and the gestural method of melodrama, along with simple pantomime, were all employed by the Biograph actors. 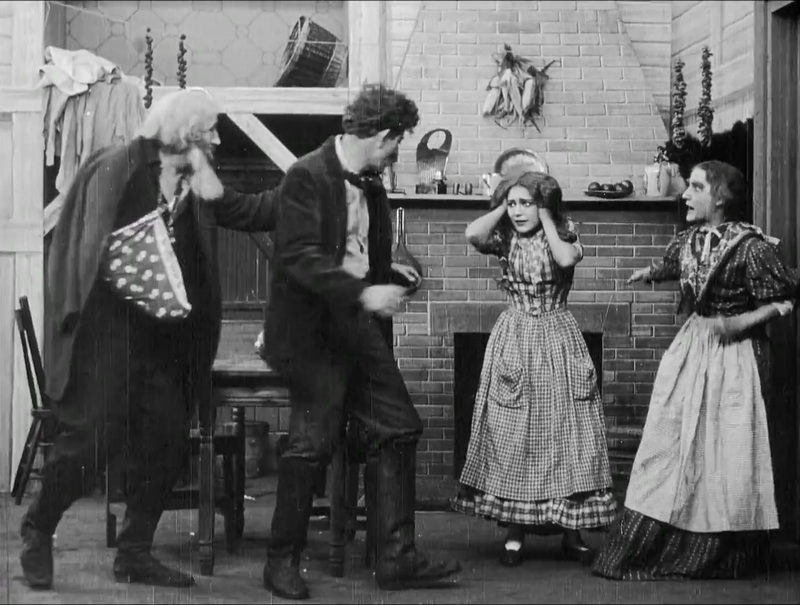 Among them, a teenage veteran of melodrama would combine naturalism with a subtler version of gestural performance: Mary Pickford became a key figure in the new art of film acting. The production schedule at Biograph — a minimum of two 1,000 foot reels containing two to four separate titles for release each week — could fairly be called brutal. 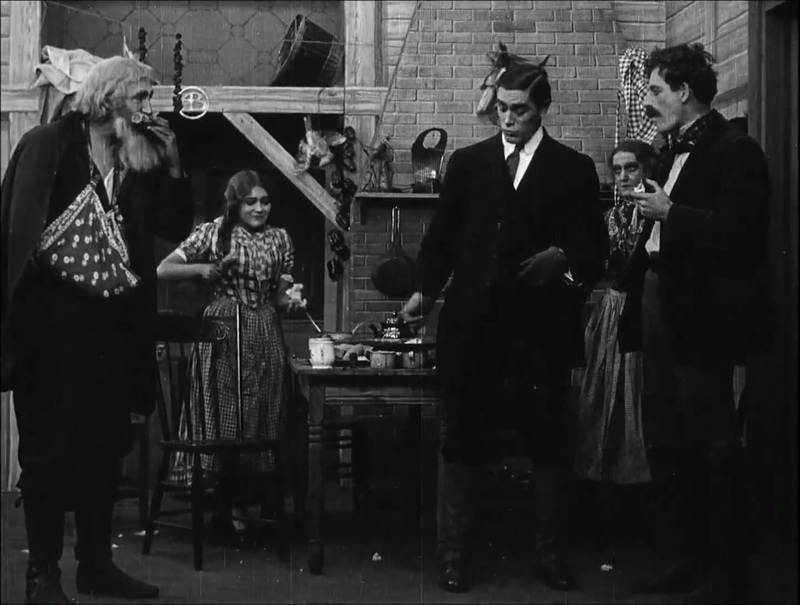 But pressure can create gems, and the closing weeks of 1909 would see the release of several films that are among the best that Biograph and Griffith ever produced. The Mountaineer’s Honor is not one of those films. But don’t allow that blunt judgment to discourage you from watching or reading further. 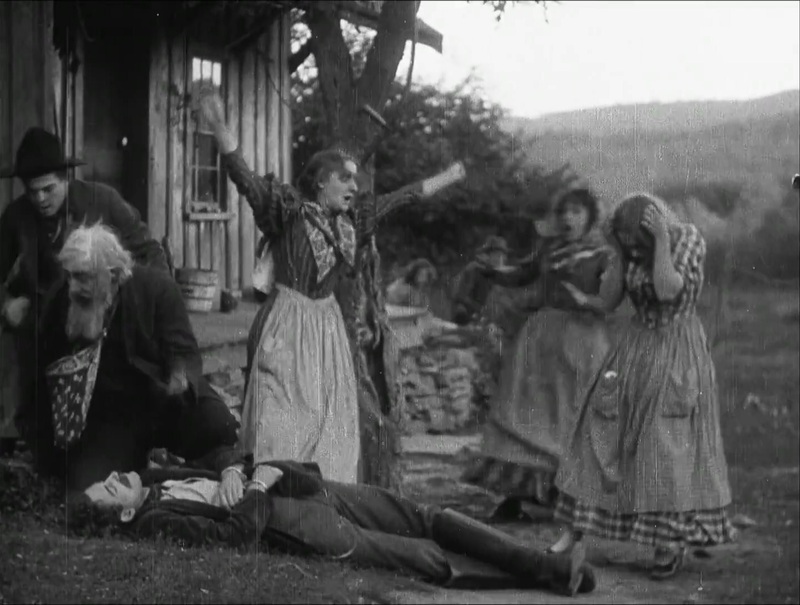 Several elements of The Mountaineer’s Honor have a retrograde feel, stodgy even for 1909: the full-length shots and frontal blocking of actors in the interior scenes, the awkward or abrupt scene transitions; the use of crude pantomime. 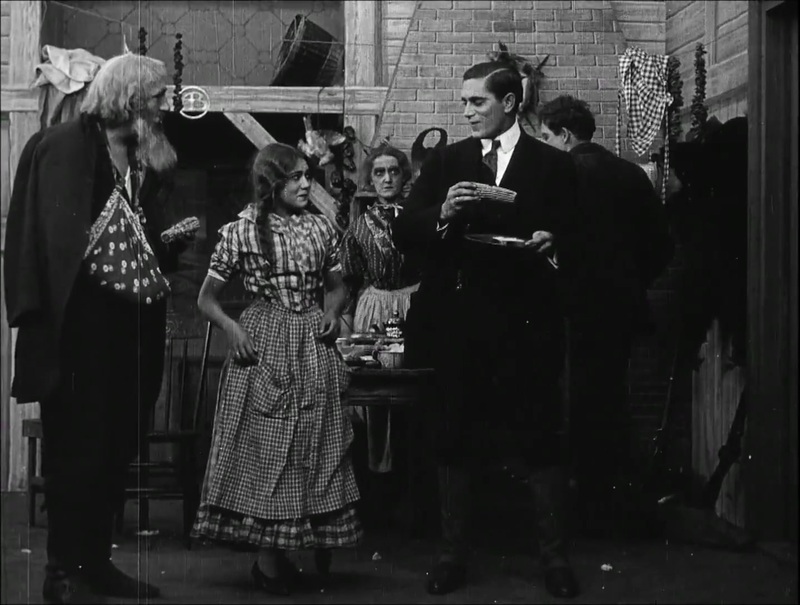 But a freshness is also evident in the frequently dazzling shot compositions, in the staging of the exterior scenes, and in the work of Mary Pickford. 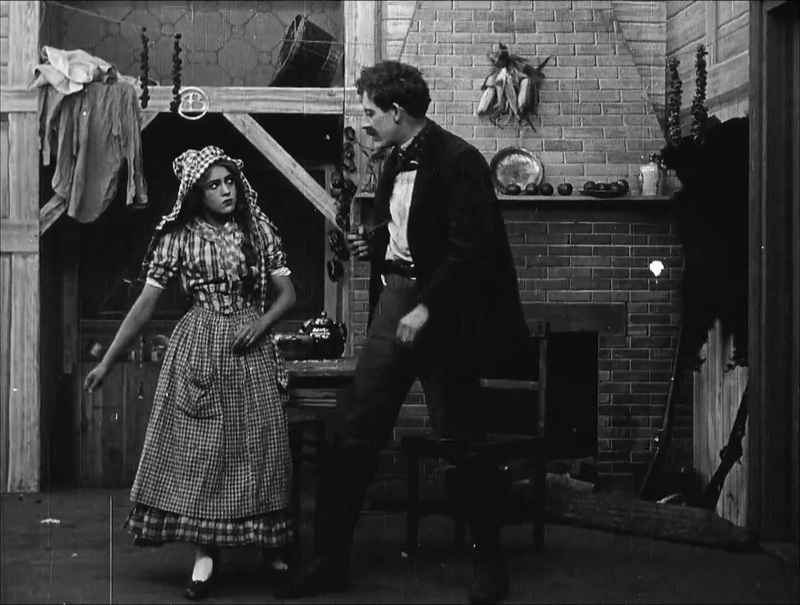 Though she appears uncomfortable in a couple of scenes (possibly a result of direction), her performance ultimately achieves an effective balance between the natural and gestural methods. While dictionaries define it as a person “reckless, impetuous, impulsive, imprudent, rash, or wild,” the description offered by the Biograph Bulletin (the company’s in-house publicity organ) emphasizes attributes of simple stupidity, such as “hare-brained” and “rattle brained.” Instead, Pickford brings to the part a youthful brashness, combined with compassion, and even an athleticism (something not often said about Mary) that enables her to avoid the silly, simpering qualities of Griffith’s later hopping, bouncing, juvenile females — the “Gaga Babies,” as Lillian Gish called them. 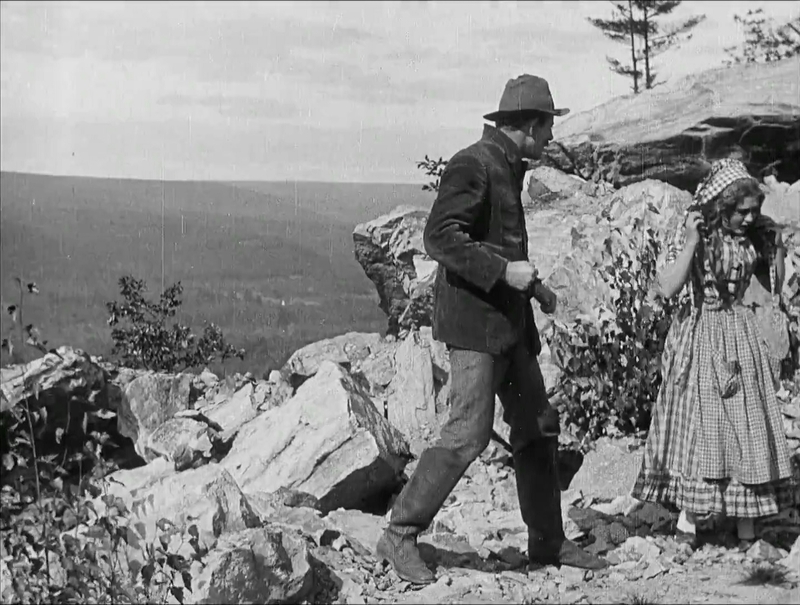 Shot during three days in October 1909 at the Fourteenth Street studio and on location at Cuddebackville in upstate New York, The Mountaineer’s Honor was released on Thanksgiving Day, the 25th of November, 1909, at a length of 977 feet, or one full reel. There are ten separate camera set-ups and a total of twenty-nine shots or “cuts.” Each shot in the film is represented here by at least one image, either still frames or single-shot GIFs. The source for all of the images is a Library of Congress transfer available in streaming HD at both the LOC website and YouTube channel. According to the website notes, it is from a 16mm “viewing print” — but one obviously made from exceptional source material. 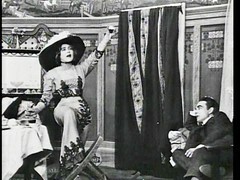 The running time is slow for a single reel film of the period — 16:23. But I can hardly complain when such a beautiful print allows us a more leisurely appraisal of the film, and of the talented Miss Pickford. [A further note on the images: all of the still frames reproduced here are from a 1080p HD download of the Library of Congress streaming source. Due to the large file sizes inherent in HD video, several of the GIFs are from 480p downloads of the same source. But regardless of format or resolution, I think the image quality is exceptional. It made the illustration of this article easier and much more enjoyable than prior efforts in this vein. Many thanks to the LOC. In addition to my narrative commentary, I’ve included the intertitles in all-capitals as in the originals. Excerpts quoted from the Biograph Bulletin plot description are included where appropriate, in italic within brackets […]. Devilish Mary turns his simple gesture of affection into a joke — she takes one sniff, wrinkles her nose and . . .
. . . she tosses the offensive petals onto the ground. Owen sits in silence, downcast. Mary thinks it’s terribly amusing and is quite pleased with her little joke at the expense of the sensitive boy. She just didn’t realize how sensitive . . .
. . . and rather than the harum-scarum, hare-brained, unappreciative creature described in the Bulletin, Mary can appreciate hurt feelings and, without hesitation, makes amends by asking Owen for another look at the flowers. Ahh, yes. This tiny bouquet is not only prettier, the smell is so much sweeter. Much to the boy’s delight and slight embarrassment, she tucks the tiny bouquet — now a treasured keepsake — safely in her bosom. Mary, with hands on both cheeks framing a wide smile (a gesture signifying happiness), shows her appreciation in a chaste kiss. A tender moment with a comedic conclusion — a demonstration of Mary’s youthful, high spirits and bouncing, boundless energy. We are taken abruptly from the scenic river overlook to the dimly lit interior of a mountain cabin, the home of Mary and her family — father (George O. Nicholls), mother (Kate Bruce) and brother (James Kirkwood) — taking their evening meal. In this tiny set inside the cramped Biograph studio, the eye is drawn from the full frontal, everyone-face-the-audience staging of the actors, to the myriad of details on the wall, including the American Biograph (“AB”) medallion nailed to the crossbeam above Mary and father. 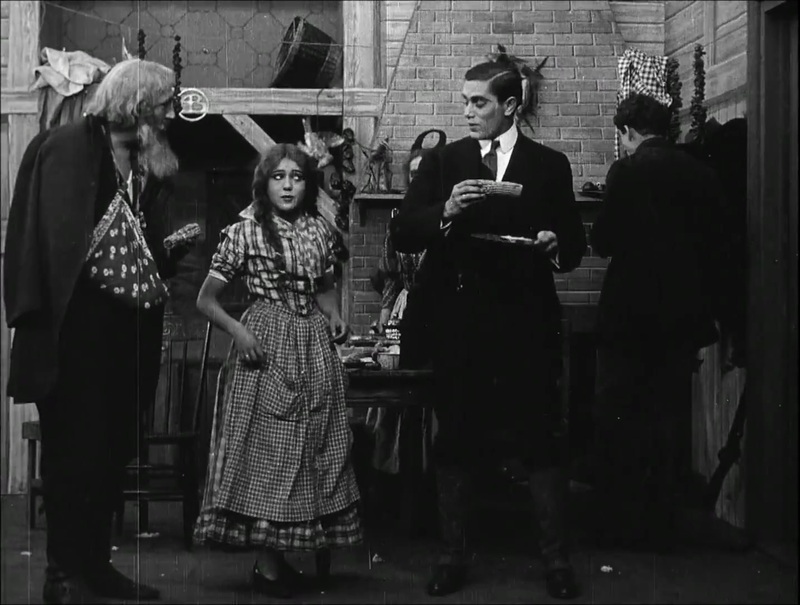 The scene is played with gentle humor at first: Mary stuffs her face with a bird leg and a chunk of bread. Father teases her, presumably about her table manners. But their quiet dinner is interrupted by a knock on the door. Mother answers and a tall stranger (Arthur Johnson) enters. Mary’s quizzical look tells us she has rarely seen a man so unusual . . . so . . . tall . . . well-dressed . . . and . . . so handsome! Arthur is traveling cross-country alone, but darkness has stranded him short of his home in The Valley, and he humbly requests food and lodging for the night. Mary smiles upon hearing his request — she hops up onto the dinner table (those awful manners again), and prepares a plate for the tired and hungry stranger. Aside from Mary, there is little indication that the rest of the family is keen on granting him the hospitality of their modest home. Her taciturn brother regards the stranger with suspicion, while mother glowers from the corner. Mary fails to suppress a chuckle as the stranger makes a small joke at the expense of her clueless sibling. Father makes the mistake of chiding his daughter for her forwardness — she responds with a withering glance. Mary alone has taken the initiative to grant food and a night’s lodging to the suave stranger, and her modest flirtation is returned without modesty by him. Arthur, grateful for the hospitality of the mountain family, extends an offer of cash as thanks, but mother refuses. Father cagily intercepts the bill before Arthur can return it to his pocket. No longer a stranger, at least not to one other member of the family, Arthur bids his hosts adieu and heads back toward . . .
. . . the Valley? Not quite. Someone awaits him in a nearby shady grove along the path . . . 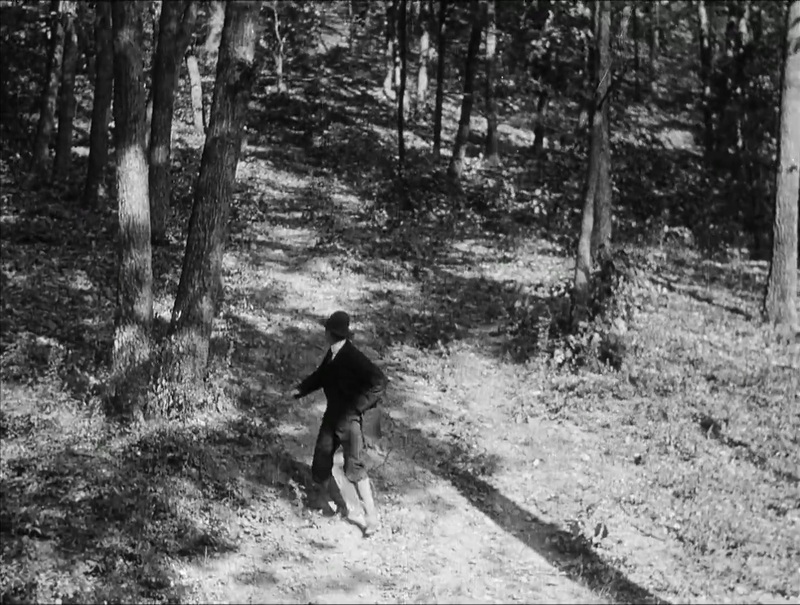 While we don’t know for sure if this rendezvous was planned, it appears that Arthur looks about for someone before he spies Mary behind a tree. She certainly seems to have been expecting someone rather special as she bounces between the trees in anticipation. While appearing rather coy, it is more likely that she is being cautious about this meeting — after all, a young, unmarried girl of the hills isn’t to be seen alone with a man not her kin, especially a stranger from The Valley. She turns and glances nervously over her shoulder; prompting Arthur to do the same. All is clear! Now he tells Mary to meet him at a point over the hill, somewhere off the well-worn path where they can truly be alone. The excitement nearly takes her breath away . . . She agrees . . . but first, she must make an appearance at the corn husking dance in the field nearby, then she can steal away . . .
. . . out of sight of her friends and family . . . and meet him in secrecy. Arthur leans in for a kiss . . . Now Mary is being coy — she hesitates for a moment, backing away . . . then darts forward — their lips nearly touching . . . and then . . . In a striking composition, we see the fiddler and the caller in profile, in near-silhouette — we can almost hear them screech and holler like the devil — exhorting the dervish-like huskers in a dance not square, but a swirling, circle of dance. Mary is barely noticeable as she blends and whirls among the dancers. But someone who is always watching her does indeed notice, peering out at her, his unhappy face framed below and between the musicians and Mary as she steps out of the dance. Mary emerges, glancing just once behind her to see if she has been noticed . . . then , in the first of many similar, if not totally explicable gestures to come, she points the way to the site of her secret rendezvous. [. . . she steals away to the spot selected.] Poor, befuddled Owen is left alone, watching his love leave, but saying . . . nothing . . . doing nothing. It’s hard to feel pity for him, he has enough self-pity for two . . . The lovers-to-be meet at a rocky overlook high above the distant blue ridge. Fierce winds whip and whistle against sharp edges of stone, barren but for a few patches of brush. It’s a hard and unforgiving place for a tender meeting — one misstep and . . . tragedy. . . .
Arthur appears to have been waiting longer than he’d like. Mary points him out . . . to no one (but us?). She hops down the jagged rocks, unseen. Arthur greets her, and in a single swift motion he clasps her forearm and pulls her closer, leaning in for the kiss he was denied in the shady grove . . . But Mary recoils and abruptly turns her head away — this is something more than mere shyness . . . it is something ingrained in the psyche of the mountain folk — a reflexive, elemental fear of strangers, strangers from below . . . from The Valley. Arthur sees that he’ll have to work a bit harder to gain her trust, to prove his motives are strictly honorable and he is worthy of that trust: he gives her an indication of his willingness to commit to a life together. Lifting her arm and taking her left hand in his, he mimics the act of placing a ring on her finger. It is a brilliant use of pantomime that informs both the audience and propels the narrative — it is a demonstration of his sincerity, which at this point whether real or feigned, only Arthur knows for certain. It also suggests, ominously, the possibility of an empty promise: there is no ring. But Arthur has more. He turns and gestures, pointing to The Valley far below — it is a promised land, another indication of his commitment to their life together — a promise that they will share his home in The Valley and a life superior to that of the bleak, dark mountains. All of these gestures of commitment are profoundly impressive to the unsophisticated mountain girl. The fear inside her is dispelled — she accepts his embrace and their bodies entwine, culminating in a deep, long kiss. 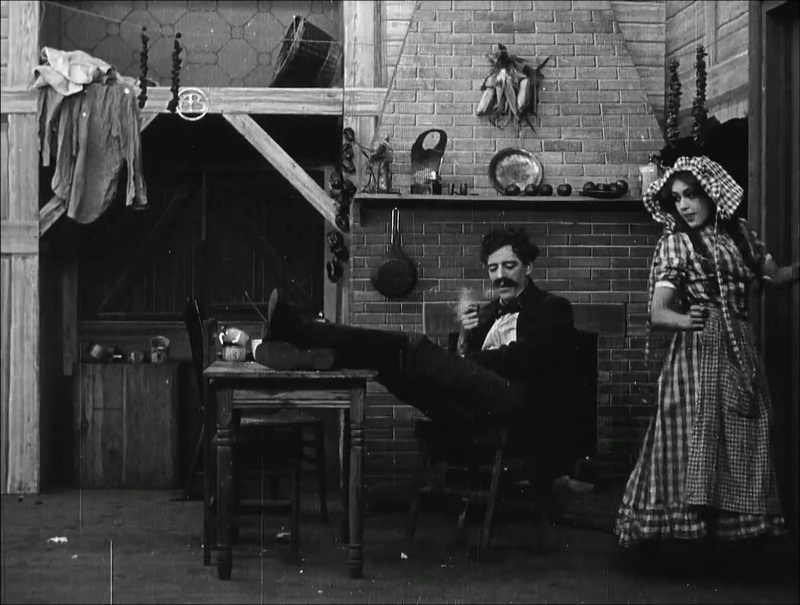 However, in the LOC viewing print without intertitles, immediately following the passionate kiss there is rough jump-cut to the next scene: Mary and her brother in the interior of the mountain family cabin. Mary is about to sneak out the door unnoticed. To meet Arthur again? For the second time? For the twenty-second time? We have no clear indication. Judging by the brother’s violent reaction in this scene, directly following the surviving intertitle, we deduce that his suspicion is grounded in some ongoing, unusual — even aberrant — behavior by his sister. His reaction makes no sense if this is the first time he sees Mary sneaking out of the cabin for reasons unknown. 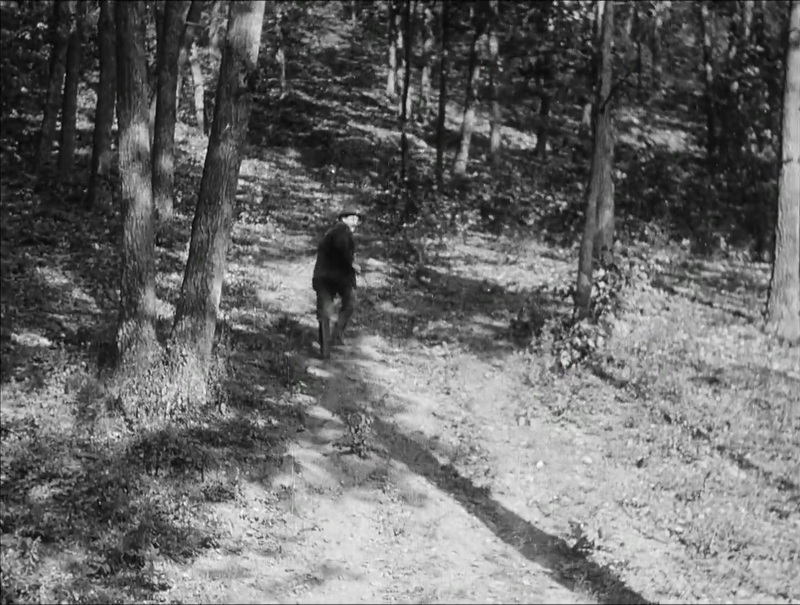 But the film gives us no guide other than a single intertitle following the couple’s embrace at the rocky overlook. At this point, we can only speculate if there is missing (possibly censored) footage or a lost intertitle. Or does Griffith prefer we use our imagination to fill in the details of the love affair? Is this simply a narrative choice — and an unfortunate one at that — dictated by the physical limits of the single reel/1,000 foot film? What is certain, based on what we are given here and what is to follow as the remaining scenes of the film unwind, is that this is the beginning of a significant change in the narrative away from the girl to the brother. His reaction to her impudence is to jerk her violently away from the door, and across the cabin floor, twisting her arm painfully. His use of force only increases her determination to do as she damn well pleases. Not only does she disobey her brother; she sticks out her tongue! Quite pleased with herself, she exits their cabin defiantly. Mary turns to see if he is following her: no. She’s safe! Yet she just can’t resist one final insult to her brother. She sticks out her tongue again as she marches belligerently away for another meeting, we presume, with Arthur. But the path takes her to an old, familiar place — the river overlook — and someone who has been less than an afterthought in the heat of her affair with Arthur. Poor clueless, forgotten Owen. And he acts as if no time at all has passed since their tender moment with the flowers. Mary, out of the corner of her eye, spots him and almost passes without acknowledging him. But . . . putting her arm above her head as a brake to her momentum, she forces herself to stop — she remembers their “past,” the tender feelings exchanged at a time that seems so very long ago. She begins to raise her arm to point — a half-hearted gesture to show him that she has somewhere else to be at this moment. . . She looks down at her hand, at her finger with the invisible ring, and smiles at the thought of the one who has promised her . . .
. . . then . . . out of this momentary reverie, she is jerked back to reality . . . Owen, the forgotten boy, is talking of their life together, their future, their . . . marriage? A look of utter terror appears on her face . . .
My God! . . . what is he saying?. . . what have I done? She gestures, hand to breast, hand to cheek . . .
. . . one hand to the left cheek, then recoiling back, one hand to the right, she shrinks further and further backward. She can think of only one way to escape this awful scene: Run! . . . to her love! . . . and she bolts, leaving Owen distraught and slumping forward, barely able to stand, crushed by the weight of Mary’s reaction . . . her rejection. But, very soon, poor rejected Owen would not be alone in his misery . . .
Mary arrives at the rocky overlook first, her face still contorted in dismay — in disbelief — at her encounter with Owen. But Arthur’s arrival immediately banishes thoughts of Owen, thoughts of anything other than her future with her love. For Arthur, this meeting has a far different purpose. 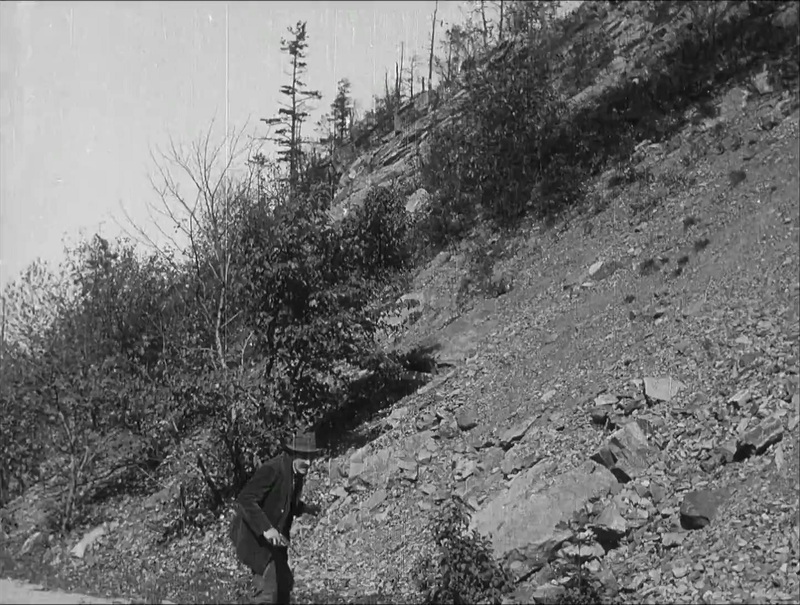 He gestures to the path leading down the mountain outcrop to The Valley . . . he must leave . . . now . . . grabbing at his watch fob . . . he has somewhere to be . . . at a certain . . . time . . .
Mary’s smile turns to a look of incomprehension . . . now, the feeling of shock she experienced only minutes ago with Owen returns. More than shock, it is becoming panic . . . Arthur is leaving . . . returning to his home in The Valley . . . without her. To calm her, he grabs her hand and points to the finger with the invisible ring . . . to remind her . . . of what? . . . that he will not . . . forget her? But vague assurances and a non-existent ring are hardly enough to calm her raging anxiety. She grabs his arm, trying to pull him closer, imploring him not to leave. He reacts by slapping her arm down and away from his chest. Mary recoils in horror. She cannot believe that this could possibly be the act of the same man who tells her that he loves her, the man to whom she has given her love, her innocence, her . . . honor. Worse, the horror does not stop. Arthur raises his right arm in a threat — he’ll slap her down if she continues to cling to him — then walks out of her life and down the path to The Valley. But . . . in the background, unnoticed, someone has followed Mary. Someone is a witness to the heartbreak and the anger: the brother. YOU . . . were . . .with . . . HIM? Using the same ring/hand pantomime, Mary’s brother demands to know if her secret lover, this stranger from The Valley who has taken her virginity, has at least promised marriage. Her silence is all he needs to explode: he strikes her in the back with enough force to knock her to the ground. He drags her by the arm across the rocks, toward the path, and raises his fist. Towering over his terrified, diminutive sister, he threatens to strike her again unless she retreats to the cabin. Having now endured emotional or physical trauma from three men in her life, a bewildered Mary this time complies meekly with her brother’s order. The appearance of their father prompts him to ask for his father’s pistol. Before father can ask the purpose, the brother is off in pursuit of Arthur. Descending from the mountains, back toward the Valley, Arthur has a sense he is being followed, hunted — a sense of foreboding compounded by the awful tilt of the massive rocks above that dwarf him — a feeling that half a mountain could suddenly fall and obliterate him. Mary, spent physically and emotionally, can hardly find strength to enter the cabin. As Arthur descends further, his apprehension grows. And with good reason: the brother is right behind, hell-bent on finding him. Finally, he reaches the Valley, but there is no chance to rest or even relax for a moment — Mary’s brother has caught up with him. As the brother approaches, Arthur feels for the gun in his coat pocket. 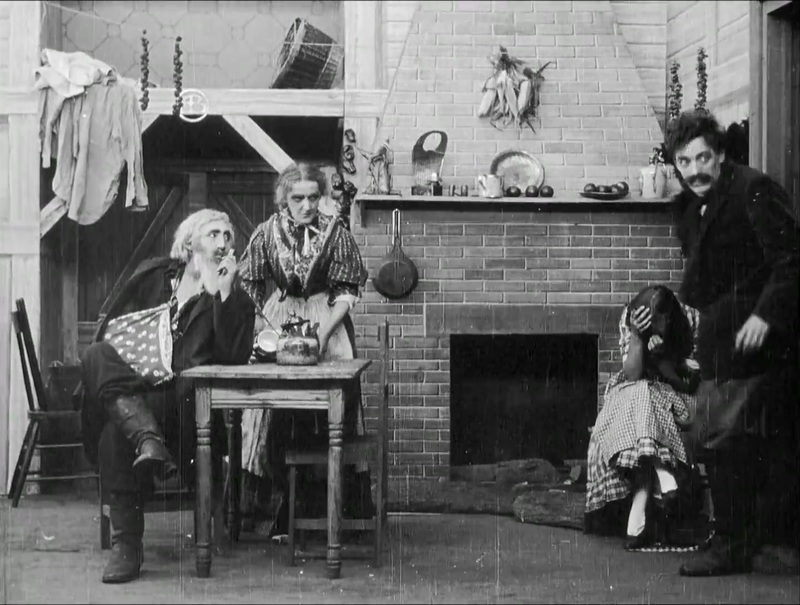 Arthur tries to appear unconcerned, calm, as the brother accuses him of violating the honor of his sister and their family. Arthur’s hand now firmly grips the weapon still within the pocket. The brother points back toward the mountains, demanding that Arthur return with him to make amends, but Arthur has heard enough — he pulls his pistol. Before he can touch the trigger, the brother has his own weapon drawn and fires once to the heart. 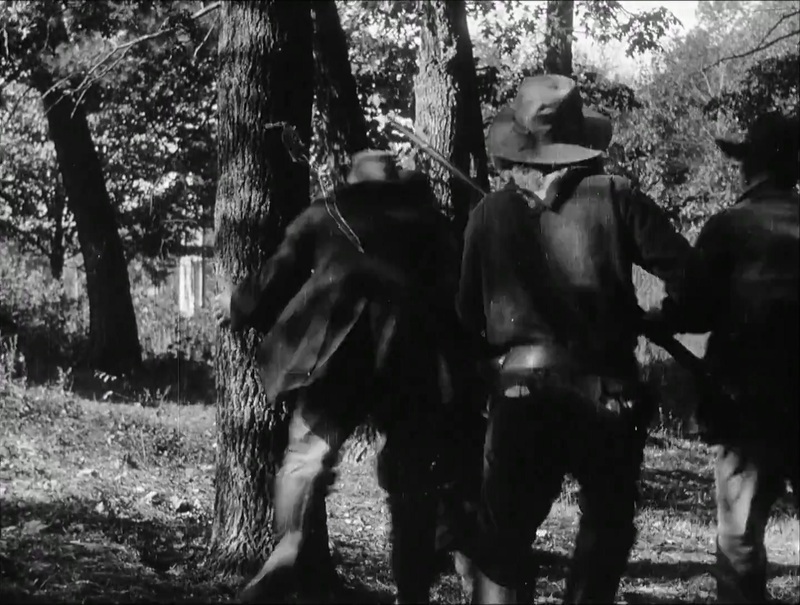 As Arthur crumples to the ground in a sickening pirouette, a townsman — a deputy lawman, perhaps — brandishes a weapon and shouts at the brother, who promptly slays him as well with a single shot. Two deaths, no justice, no honor. 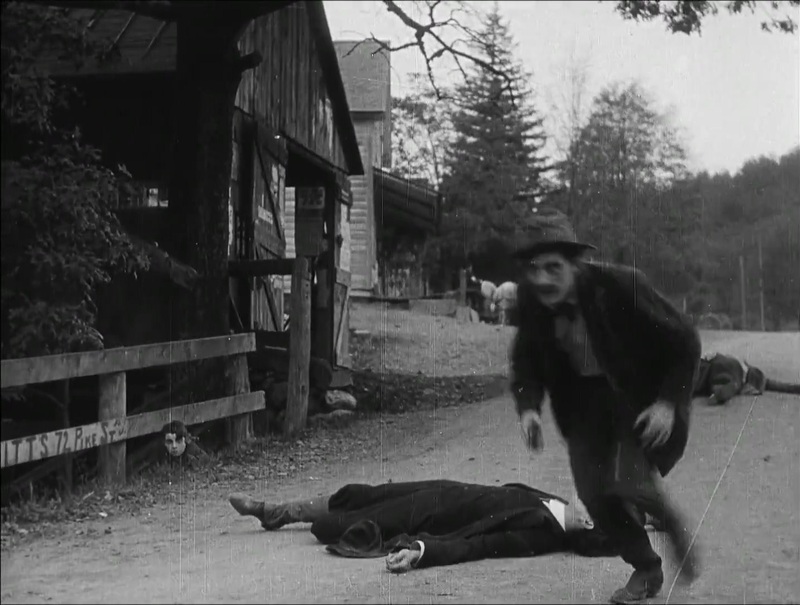 He takes but a moment to make sure the man is dead and to hurl an invective at his corpse, when a small group of townspeople, having heard the gunshots, begins to gather. The brother flees, up the path to sanctuary in the mountains. 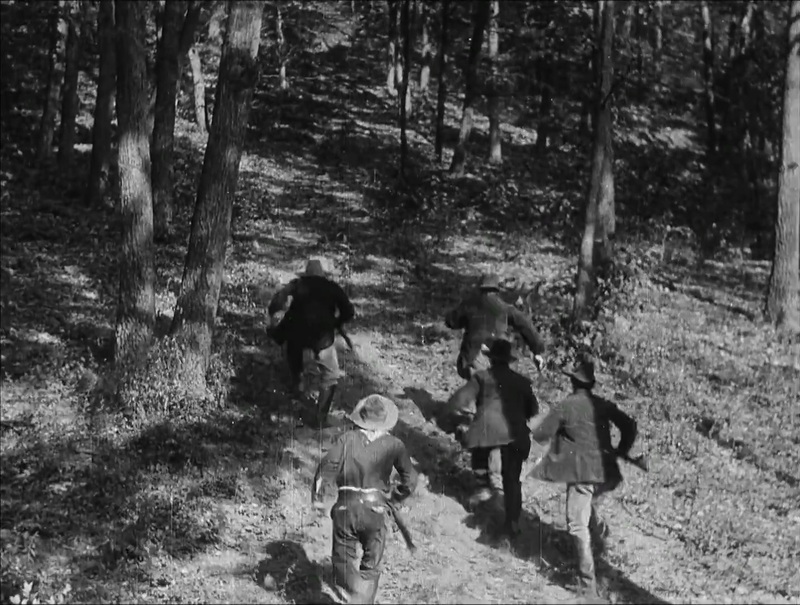 Immediately on his trail are the town sheriff (Anthony O’Sullivan, at far left) and an impromptu group of vigilantes (including Mack Sennett, next to O’Sullivan). In a reversal of the alternating shots used to construct the downhill pursuit of Arthur from the mountains to the Valley by Mary’s brother, we retrace the path, from the Valley up to the mountains, as the brother is pursued by the Sheriff’s posse. 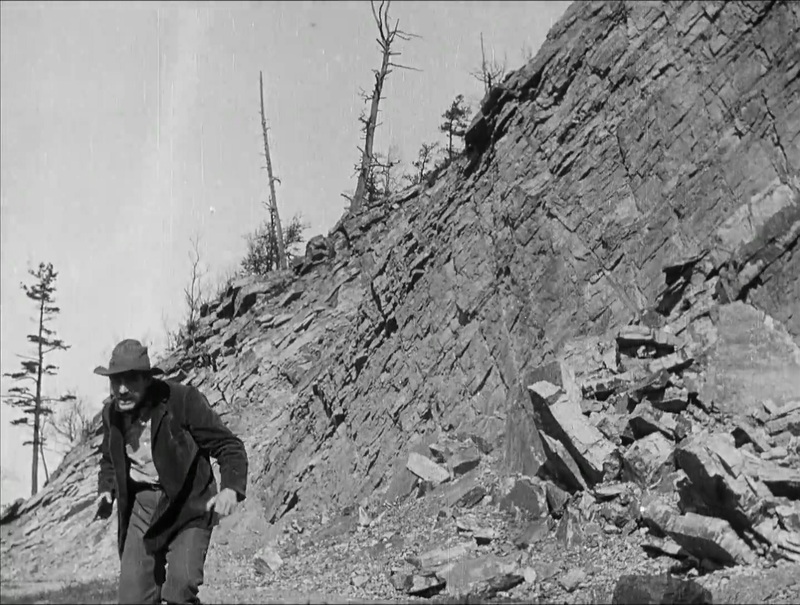 Here, the compositions of cinematographer Billy Bitzer take full advantage of the rugged, angular landscape. Rock ridges cut diagonally across the frame in uphill shots, including overhead shots that anticipate the modern crane shot (at right in each of the two sets of shots, above). 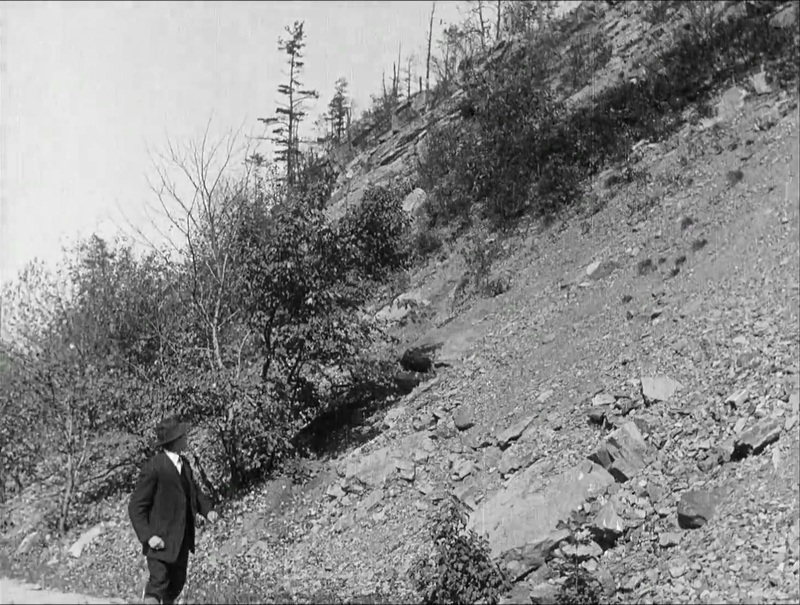 Innovative camera work does the heavy lifting for a routine (even for 1909) editing scheme — a simple sequence of alternating shots — adding tension and sustaining interest in the otherwise ordinary chase sequence of men on foot, rather than the intrinsically more exciting planes , trains and automobiles! variety. As the chase up to the mountains continues, the rock formations look much more daunting than they did when we followed the earlier chase downhill. 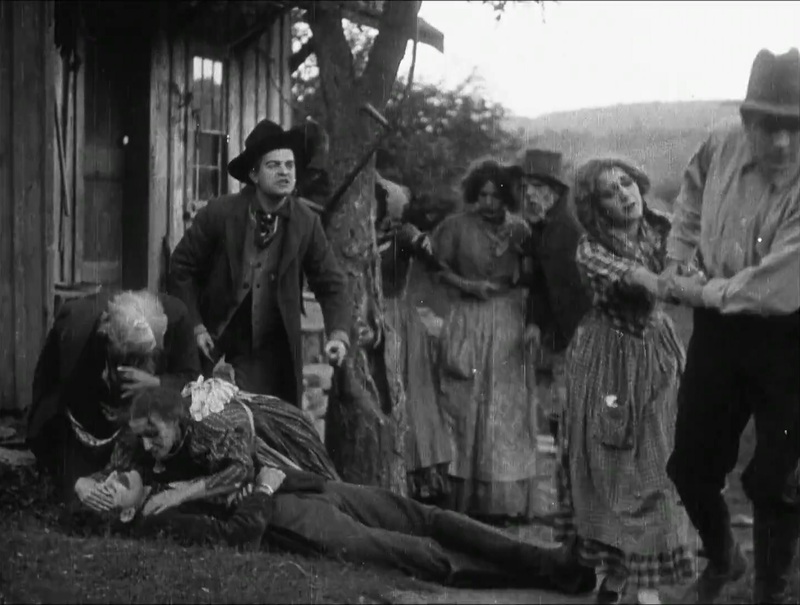 As the posse attempts to scale the rocks, the brother bursts through the cabin door. Father, mother and Mary, still sobbing over the breakup with Arthur, have no idea what has transpired. The brother tells his family what he has done; the Sheriff and his vigilantes make their way through unfamiliar woods — now quite familiar to us as the first private meeting-place of Mary and Arthur. Mary is crushed — now, for a second time — by this news. Does she cry for Arthur? For her brother? For what she may have set in motion by her actions? Does she have any way to stop this hellish chain of events? Is she is trying to console her brother or is she now taking out her anger on him as he did to her at the cursed meeting place? The family turns on her — father, brother and especially mother now unload their anger and anguish on Mary. Hands on her head, on both ears — she cannot withstand the pain. But there is no time for accusations or blame — men are assembling outside the cabin — mother hears their approach. 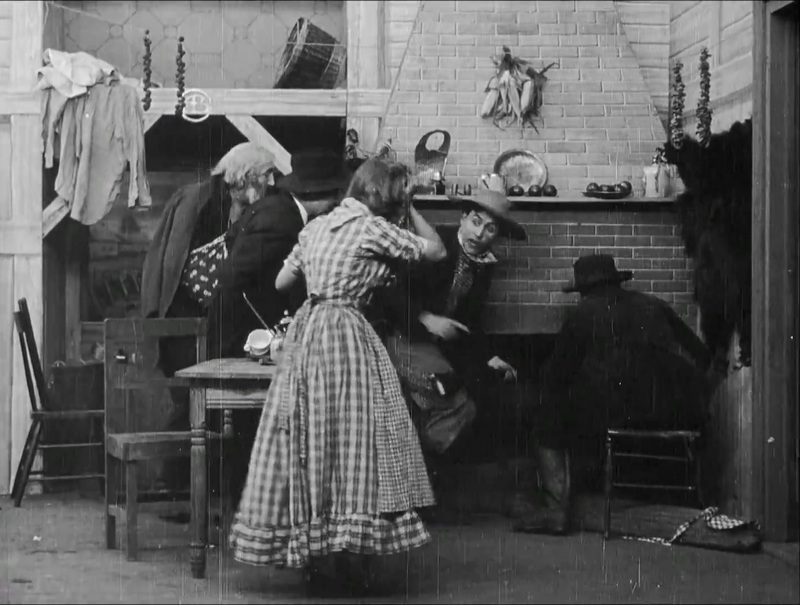 As the family desperately looks to hide the brother — inside the fireplace chimney! — mother charges through the front door to confront the vigilantes, to defend her family, alone! 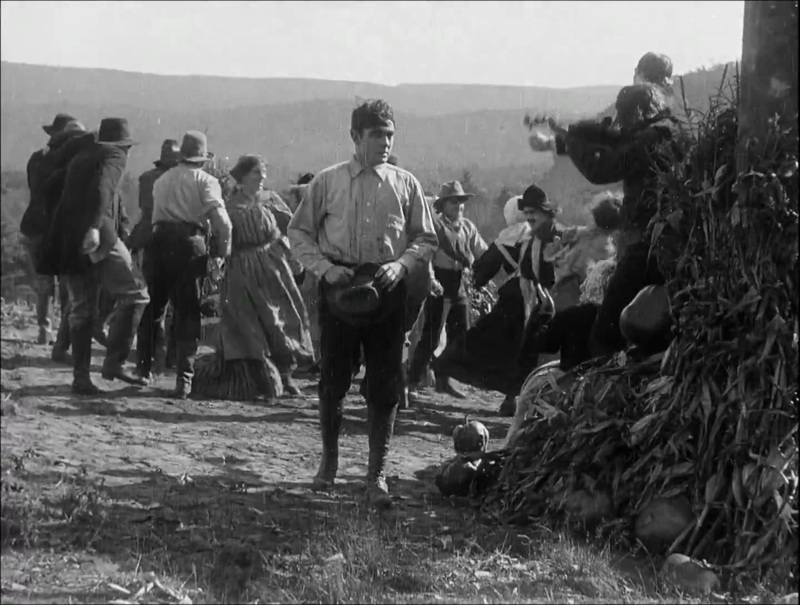 In one of the high points of the film, Kate Bruce flails away fearlessly with only a stick of wood as a weapon, bashing the heavily armed vigilantes with ferocity, until their numbers overpower her — a Kentucky Blue Mountain version of Davy Crockett at The Alamo. Though defeated for now, she will have her say — and soon. Sheriff and vigilantes burst through the door and begin searching for their quarry while Mary can do little but wring her hands. But the tiny cabin cannot keep its secrets for long, and the brother is easily found, cuffed and marched through the door as the Sheriff points (!) the way . . .
Mary’s final action in response to her brothers capture . . . is . . . fascinating. She holds out both arms, hands together, fingers clutched tight. Is it a gesture signifying frustration or anger . . . or . . . is she offering up herself to the incredulous lawman in place of — or with? — her brother? Does she feel that depth of guilt? The sheriff acknowledges her but for a moment before slamming the door shut behind him. Mary flails away at the door, now helpless to change the awful course of events that began with an innocent flirtation at that same spot. Mother reappears, none the worse from her battle with the men — she thrusts out her arm to halt the procession and demands to know what will become of her son? 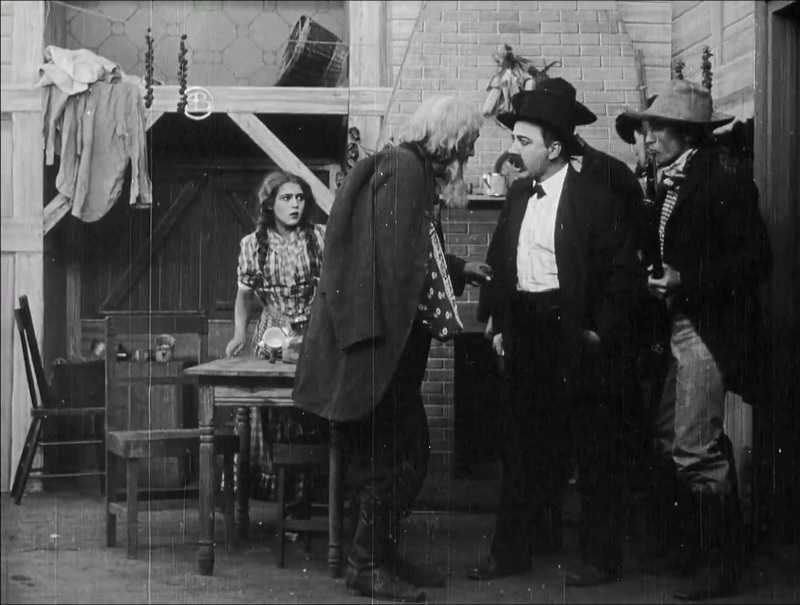 The sheriff responds with grim pantomime . . .
. . . and in return mimed by mother in acknowledgement of the vigilantes’ intentions. It is raw, crude pantomime, and to a modern audience possibly comic, but still conveys its meaning with brutal efficiency. Mother makes one more request of the lawman — a drink for her son. A sop of wine or vinegar? No . . . it is . . .
. . . water . . . plain and pure . . . but with a message . . . delivered once the backs of the lawmen are turned . . . a message to her son: there is a way to avoid the ignominy of the noose, the hideous degradation of a sentence without jury verdict, without trial, a veritable lynching, family honor forever stained . . .
Then, the fatal shot delivered, the hangman deprived, and . . . honor . . ? Now, three dead . . . is justice to be found? Honor? 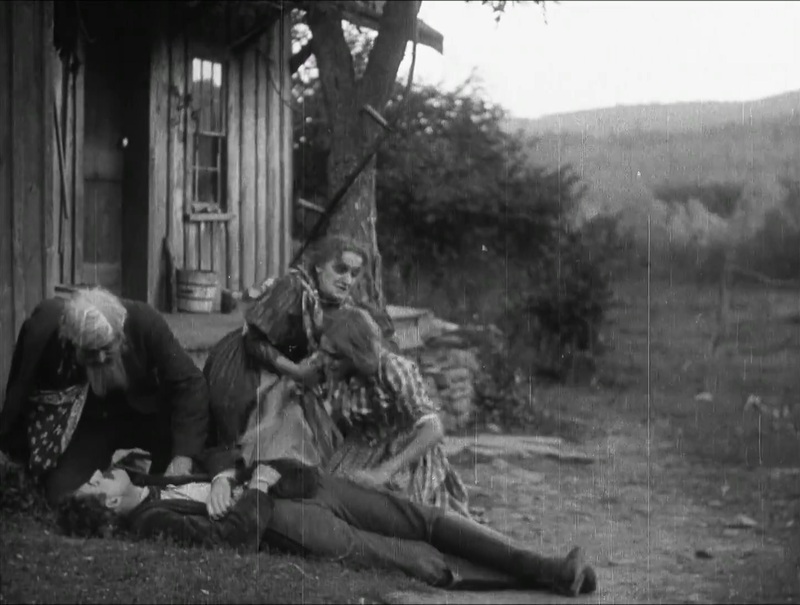 The shock of the act does not last long for the sheriff and vigilantes, nor does this filicide incriminate further any of the mountain family in the eyes of the sheriff. Their work being accomplished, though by hands not their own and outside the law, the sheriff and his men leave for the Valley, satisfied. And, of course, as a final punctuation to the sad scene, the sheriff points. Mary emerges from the background and in grief throws herself on her brother’s lifeless body . . .
. . . but mother takes umbrage . . .
. . . and tears Mary away from her dead son. With a sweeping gesture, mother banishes Mary from the scene — and from the family — with father’s consent echoed pointedly by outstretched arm. Drawn to the scene by the sound of gunfire and the sight of the Valley vigilantes, neighbors and “friends” begin to congregate. Now an outcast, Mary is immediately a viable target without defense for those who will point and accuse, laugh and ridicule and blame her for all that has transpired, before her brother’s body is cold. But someone still faithful, still loving, cannot turn her away . 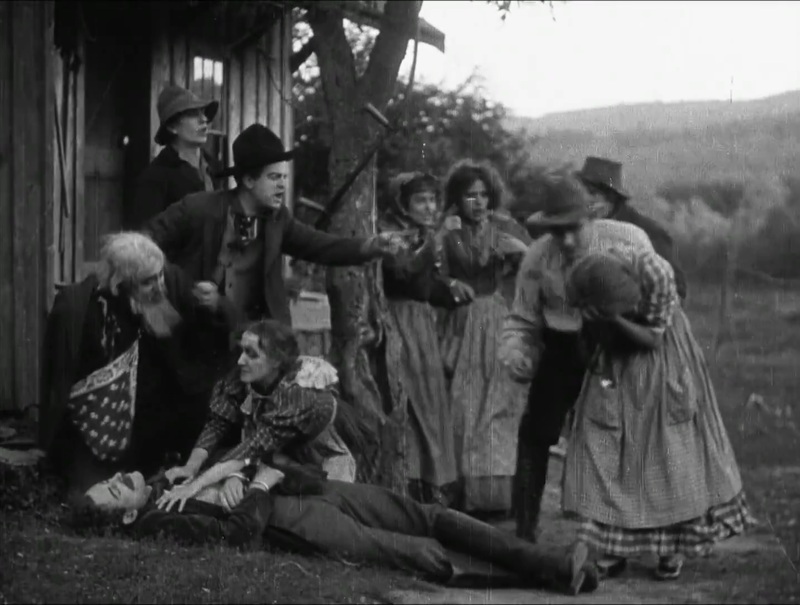 . . Owen, finally finding the fortitude to stand for the young woman, answers the cowardly assault of defenseless Mary and removes her from the easy cruelties of the mob. He takes her, limp with exhaustion from the trauma of accusation, to their place . . .
. . . the river overlook, green with life, with gentle breezes, and cool water, not hard unbending rock, below. He, too, now makes her a promise from a high place: A life of love already tested through a sort of infidelity, an infidelity that he can overlook, either in wisdom or innocence . . .
Will Mary, so recently traumatized, believe in the promises of the sensitive young mountain poet . . .
the mountain idealist whose candor she may only now fully appreciate?.
. . . in wildflowers. 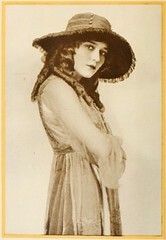 Mary Pickford. Although I’ve already tipped my hand in the introduction to the film, let’s look to see where and how MP performs this alleged (by me) balance between the natural and gestural methods of screen acting. 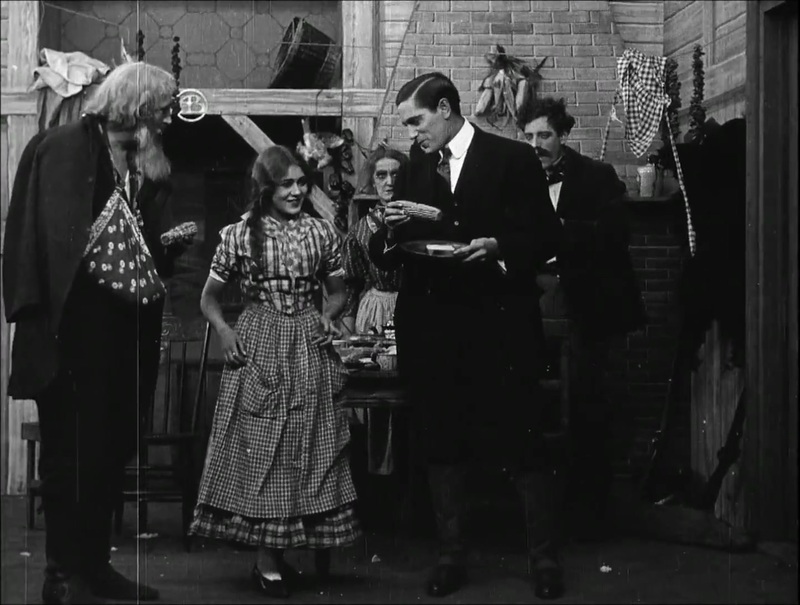 The opening scene is famous — although infamous has also been used — for the hopping bunny action that Griffith directed his younger female leads to do as an indication of their youthful high spirits and toxic cuteness. Some did it dutifully (Mae Marsh), some refused (Blanche Sweet) and some allegedly refused: Miss Pickford. Contrary to her much later and much-quoted refusal (circa 1960), she performs the bunny-hop-of-the-damned! before our unbelieving eyes in the opening seconds of the film. However, we can’t help but notice a smile that betrays a slight embarrassment as she makes her final leap to Owen Moore’s side. That look — an expression of an outer, self-awareness by the actor — is hilarious, but it doesn’t make up for the basic silliness of the direction she’s been given. Fortunately, she doesn’t repeat it in future scenes (although there will be echoes of it) in which Pickford will express “youthful high spirits” by more earthy — and yes, natural — actions. For the remainder of the opening scene, the byplay between Pickford and Moore is unforced, comfortably played and received. 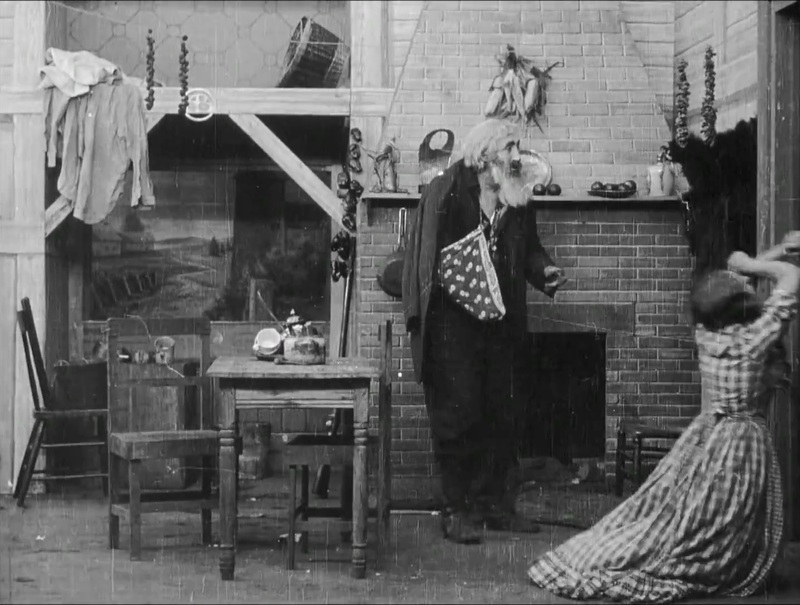 This includes the mugging facial contortions Pickford exhibits as she examines and smells the flowers. 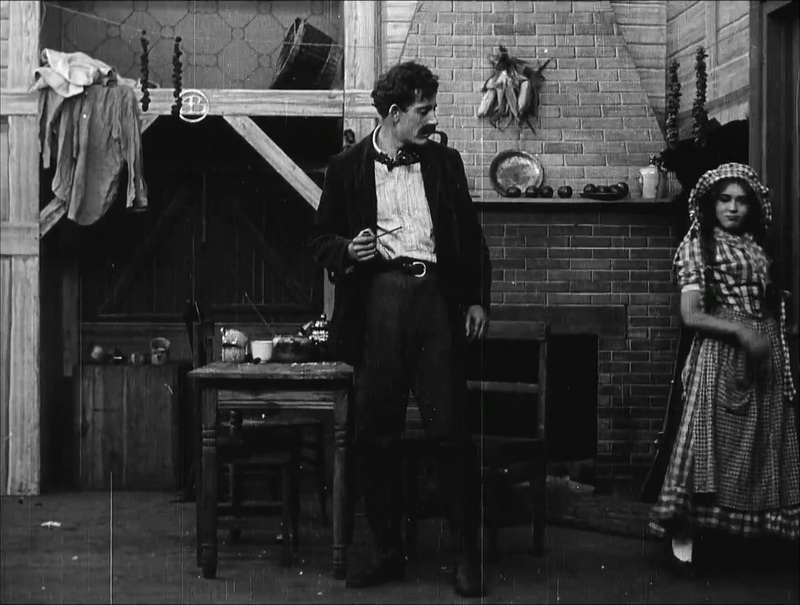 The mugging works because it is intended as a joke at the expense of her bashful boy-admirer, and that exaggeration works effectively to set up the remainder of the scene. We see the giddy laugh and self satisfaction disappear from her face as she sees the effect of her prank upon the boy. At first, her smugness is replaced by a very quick eye roll — a brief but believable touch that contrasts with the coming pathos. Rather than once again hopping back to his side and slapping his shoulder, she now walks slowly, softly, eyes locked onto Owen and her hand extended as she asks him for another bouquet of the wildflowers. The scene turns immediately upon her smile as she sniffs the petals, then reaches a minor peak — just the right amount of sweetness and sincerity — as she tucks the tiny bundle into her blouse, next to her heart figuratively. All done through facial expression, eyes and non-exaggerated posture — and in a full shot, i. e., from head to feet. No close-ups. Not even a medium shot from the waist or knees. 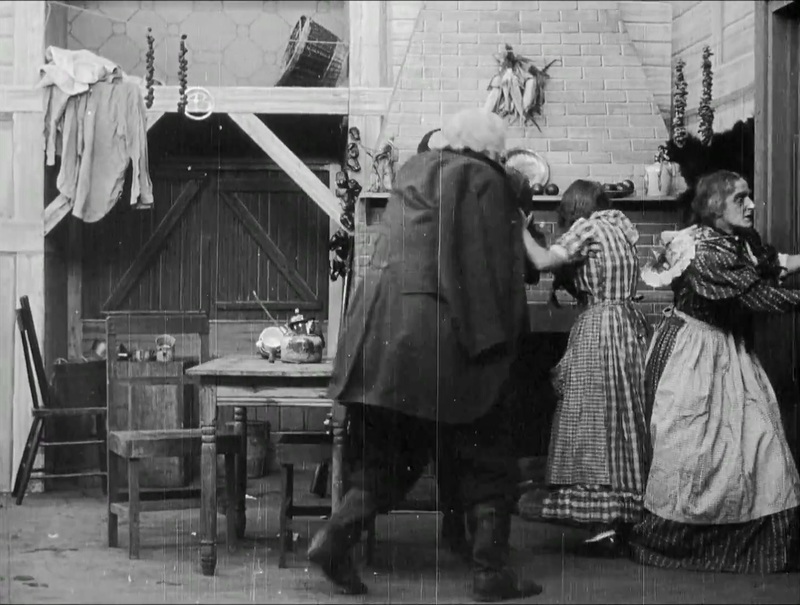 What comes next is the single undiluted example of the gestural method of melodrama in the scene: the “happy” face. 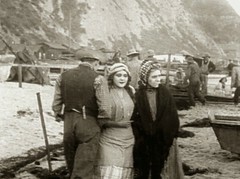 Pickford slaps her cheeks with both hands framing for an instant a broad smile and beaming eyes directed at Owen. The gesture is punctuated with a kiss on his cheek — not a gesture in itself, but instead giving the opposite impression — spontaneity. Does Mary display a certain chemistry, a casual comfort with her partner-in-scene? Of course. They had a familiarity, a friendship and, after a couple of excursions by the Biograph troupe to the romantic woods of upstate New York, a level of intimacy. Fourteen months later they would become, secretly, husband and wife. 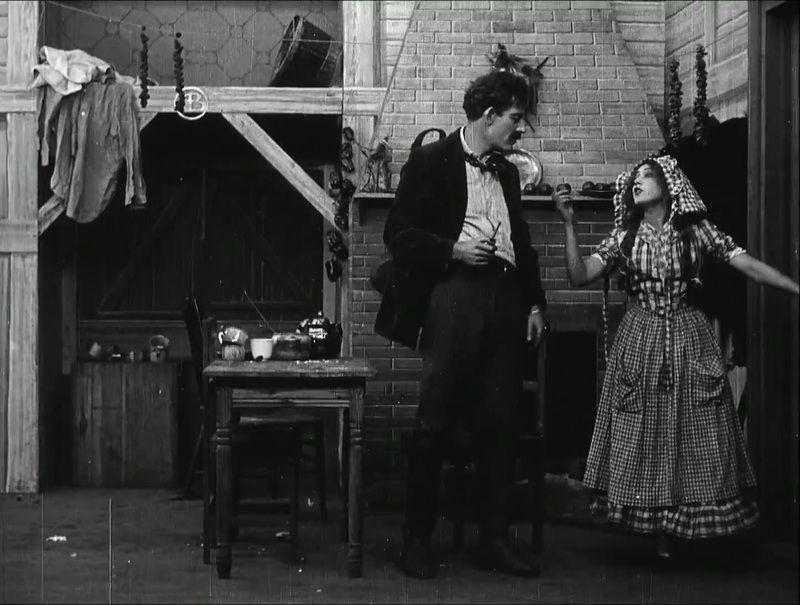 Postscript: A few more thoughts on the film ~~ and D. W. Griffith. It is legitimate to ask whether Griffith’s depiction of the ways of Kentucky mountaineers is any more accurate than his portrayal, five years later, of the freed slaves of the post-Civil War South in The Birth of a Nation — or even of the KKK and former slaveholders in that film. Where one film is a gross distortion of history, the other could as falsely depict a lifestyle — one equally distorted, living only in fantasy. 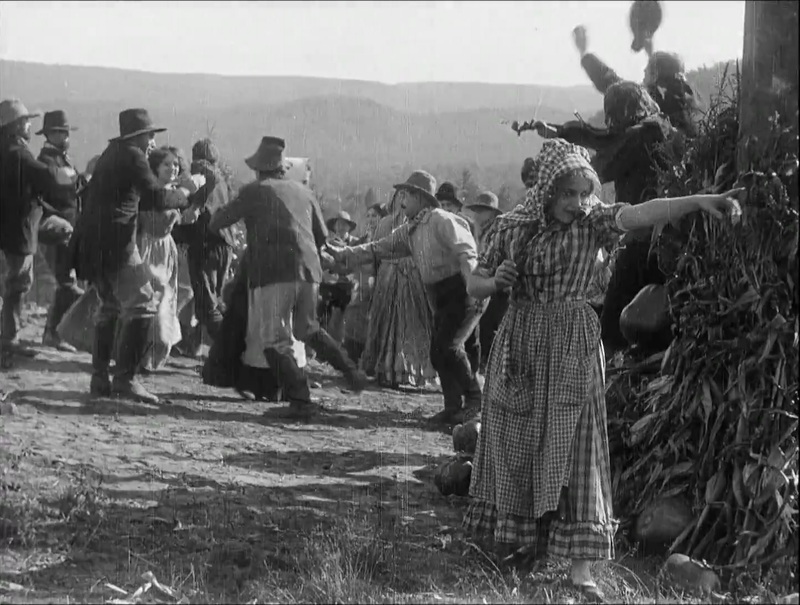 When assessing the works of D. W. Griffith, we must keep in mind that he was not a historian or a writer on histories or race or anthropology, nor was he a film documentarian; he did not rely upon historians or anthropologists or sociologists in the creation of his films when he worked for Biograph. Even if he had such resources available at the “sausage factory,” he’d have had no time to adapt them to the work at hand. First and foremost Griffith was — and thought of himself as — a dramatist. More pointedly, he was a dramatist trained by the experience of performing in melodrama. That experience was primarily in the lower tier of touring stock companies in which melodrama was the lifeblood. Generally, the more romantic and extreme, the better. 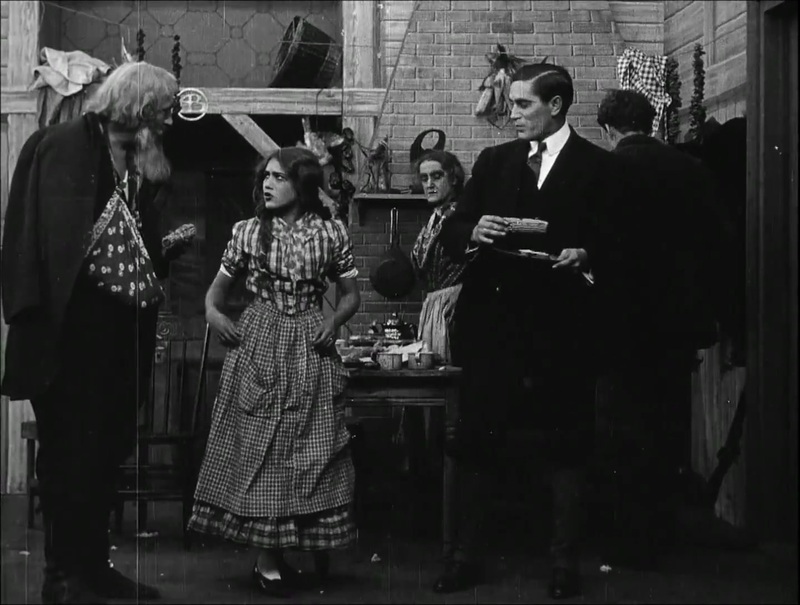 Not until his brief gig with the Nance O’Neil Company — only three or four years prior to The Mountaineer’s Honor — did Griffith appear in a top-tier theatrical company. 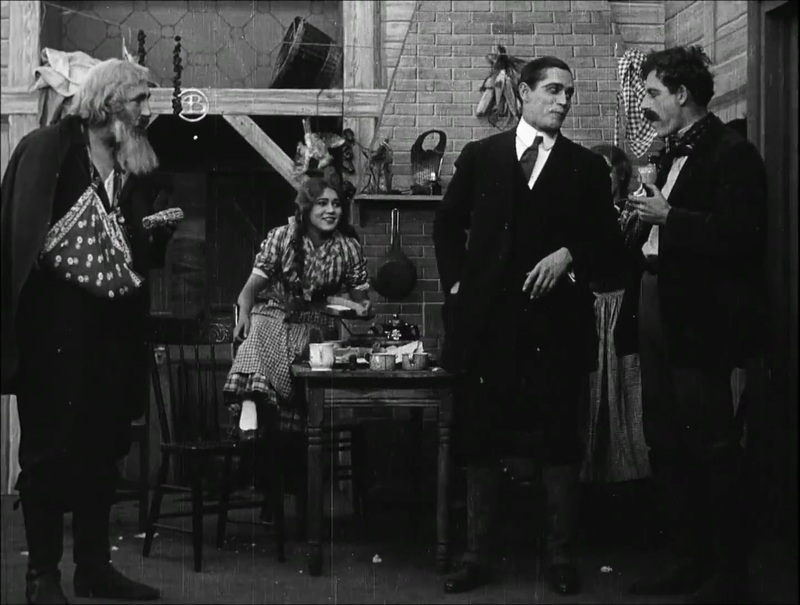 His acting and play-writing and his films were infused with the art and artifice of the melodrama, in which dramatic tension and excitement are generated by opposing forces, evil and good, white and black, guilt and innocence, and so on: the stuff of dreams for a dramatist, as Griffith defined himself. The basic character of the man and his beliefs on race, on women, and on morality, find their expression through the bipolar world of the melodrama. A world where good and evil clash eternally and, though contrary to modern perception of the form, good does not always win out. Evil often left its ineradicable mark in the Biographs, even when good had sole possession of the final fade-out. But the perception what is evil and what is good has its origin in the mind of the creator — the dramatist. 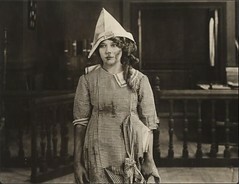 In The Clansman/The Birth of a Nation, a more or less independent production (Griffith had left Biograph by 1914), Griffith’s immersion in melodrama and its more extreme forms, coupled with the extremes of racial intolerance on which “The Birth” was based, resulted in a film unlike any before or since — one that neither Biograph nor any other firm could have or would have released. The result of the mixture of these extremes — one a popular art form, one a dark side of human nature — was The Birth of a Nation, a grand mal fantasy of civil war and reconstruction. And as the creator/dramatist, Griffith’s own extremes of belief were clearly exposed. 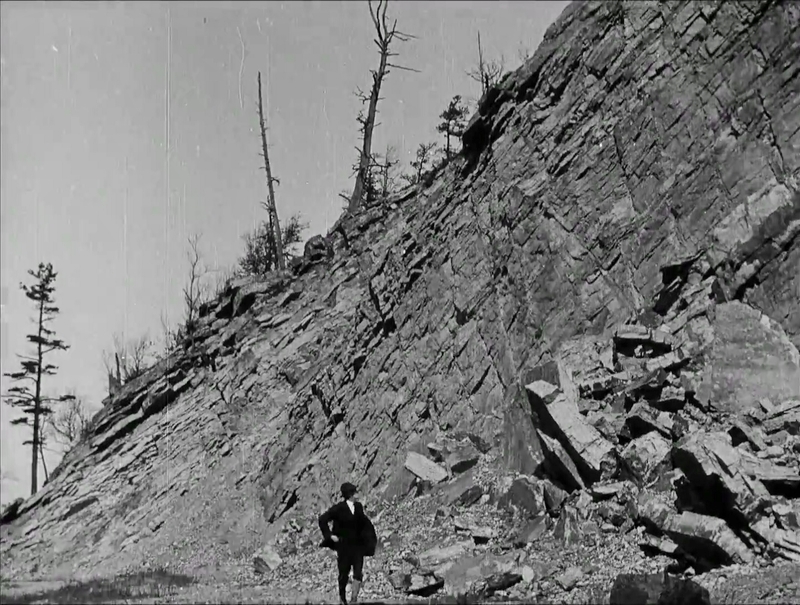 In The Mountaineer’s Honor, despite the heroic implications of the title (Griffith’s film titles and intertitles were typically heroic or portentous), there is no honor at the end of the film. We leave it, scratching our heads asking whether such a thing existed in the film in the first place. Is it more likely that the deaths of three men, one of whom was essentially caught in the crossfire, would restore a dignity once held but now lost? And restore to whom? Arthur’s execution results in a bystander’s death at the hands of the brother who, rather than standing up and facing the consequences — justice by law, or by vigilantism — squeaks out of this plane of existence by means of a bullet from the one who brought him into the world: mother. Does any viewer believe the brother is even acting in the interests of anyone but himself — or, at best, some extreme, warped concept of honor? Having watched him beat up his tiny sister at the rocky outcrop, can we believe he cares one whit about her, or her honor? I think the answer is found, ultimately, inside the cabin, behind that closed door, as mother and father sit alone at their rough-hewn dinner table, staring at the walls, with no son, no daughter, no possibility of grandchildren. How ironic that they are now tainted, stained and “shunned as moral lepers” (to quote The Biograph Bulletin), having murdered their own child, avoided then forgotten by former friends and neighbors — left to themselves and thoughts alone of . . . honor. Then again, remembering that we are analyzing melodrama in its extreme form, the modern reader and viewer may be more likely to agree with the conclusions of the reviewer from The New York Dramatic Mirror, below. “‘The Mountaineer´s Honor’ (Biograph) — The dramatic possibilities in the standard of honor recognized by the mountaineers of Kentucky or some other Southern States have never been adequately recognized. The capable Biograph company has succeeded in reproducing graphically and convincingly one of these picturesque, though pathetic, scenes. It can be understood how ferociously a brother might follow and attack the betrayer of a sister, but the peculiar standards which make hanging such an ignominious form of execution will be scarcely comprehensible to one who has never known of the peculiarities. Under such circumstances it may, perhaps, be plain why a father should drive his daughter away. No matter how unsophisticated one may be, the parents are not likely to display any compassion, and this scene is unquestionably accurately reproduced. “Not all unfortunate girls have a lover ready to accept them regardless of what has occurred. This human touch by the Biograph people gives a more pleasing ending than would the stern justice of the parents who turn their daughter away. More sinned against than sinning, and therefore entitled to charity, such girls excite pity rather than a sense of justice. Dramatically this picture displays great strength. Photographically it is clear and the action of the characters is smooth and without unnecessary waits or melodramatic movements.” The Moving Picture World, “Comments on the Week’s Films,” December 4 1909, pp. 799-800. 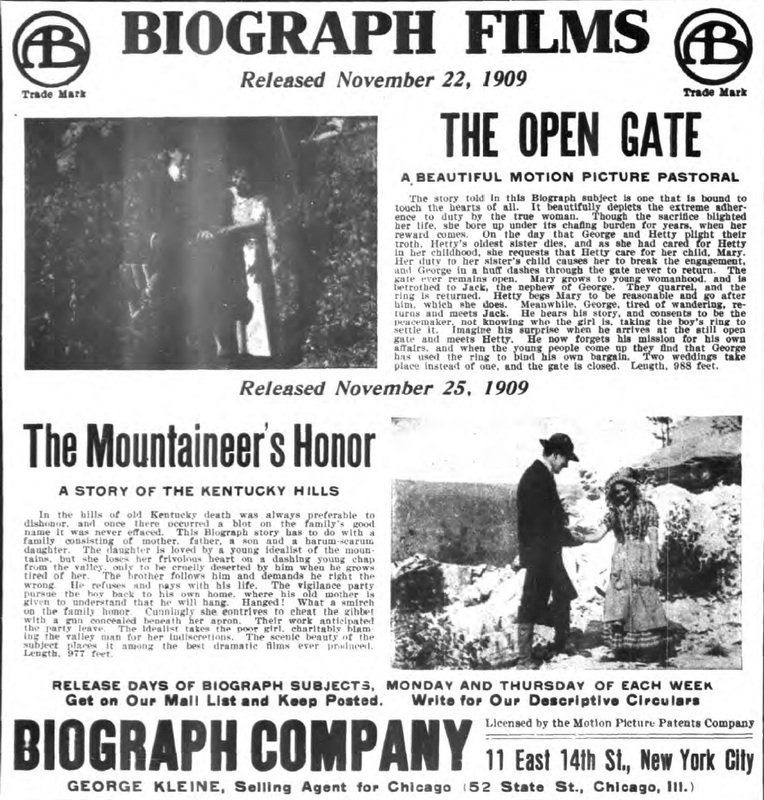 “‘Mountaineer’s Honor’ (Biograph, Nov. 25). — This is an exceedingly powerful and absorbing film tragedy, pictured amidst mountain scenes of marvelous beauty, which are presented to the best advantage by artistic photography. A phase of life peculiar to the mountain country of Kentucky is depicted, for the most part, with wonderful fidelity, and the characters are faithfully draw with one exception, that of the young girl called Harum Scarum. “This pretty miss, while altogether charming, is a bit too forward and kittenish in the presence of strangers to be accepted as a true type of that region, where unfamiliarity with the people of the world tends to make the inhabitants, especially the females, excessively shy and bashful until long acquaintance has won their confidence. She is smitten at first sight with a young “valley man,” who has sought shelter for the night in the mountain cabin, and when he repeats his visits she gives her heart, and her honor, also, we are led to believe, into his keeping. But he deserts her and then her brother pursues him to the town, where he kills him. “The town men retaliate by pursuing the brother up the mountain to his home, where they capture him and are about to take him back to hang him when the mother, to save him from the disgrace, shoots him by her own hand. The girl who has caused the trouble is then banished from the house. But a mountain lover comes to her rescue, so we presume she is provided with a home. “The acting of the principals is so uniformly good that the spectators will probably overlook certain structural weak points in the story. The young town man’s home is evidently among the people where he is killed, else they would not have troubled themselves to lynch the man that killed him. The mountaineer’s home is also close by, as distances go in that region, as the pursuers run all the way up the rugged and picturesque hills to catch him. And yet at the opening of the story the young town man is so far away from home that he seeks shelter at the mountain cabin for the night. It is also difficult to appreciate the mother, who kills her son because he is threatened with the noose. It is doubtful if the mountaineer’s sense of honor goes that far. It is more probable that she would have waited her chance and used the gun on her son’s captors.” The New York Dramatic Mirror, “Reviews of Licensed Films,” December 4, 1909, p. 17. Biograph Company Advertisement of their latest releases, in The New York Dramatic Mirror, November 27, 1909. New York NY Dramatic Mirror, 1909 Jun – Aug 1910 (Archives of The New York Dramatic Mirror at fultonhistory.com), for The New York Dramatic Mirror: Review, “The Mountaineer’s Honor” and Biograph advertisement .